Upon the death of her husband, an aging countess (Ingrid Pitt) accidentally discovers that young women’s blood makes her youthful again, and enlists the help of her loyal lover (Nigel Green) in securing victims. Meanwhile, she arranges for her visiting daughter Ilona (Lesley-Anne Down) to be held hostage by a mute gamekeeper (Peter May), and seduces a handsome lieutenant (Sandor Eles) while pretending to be her own daughter. 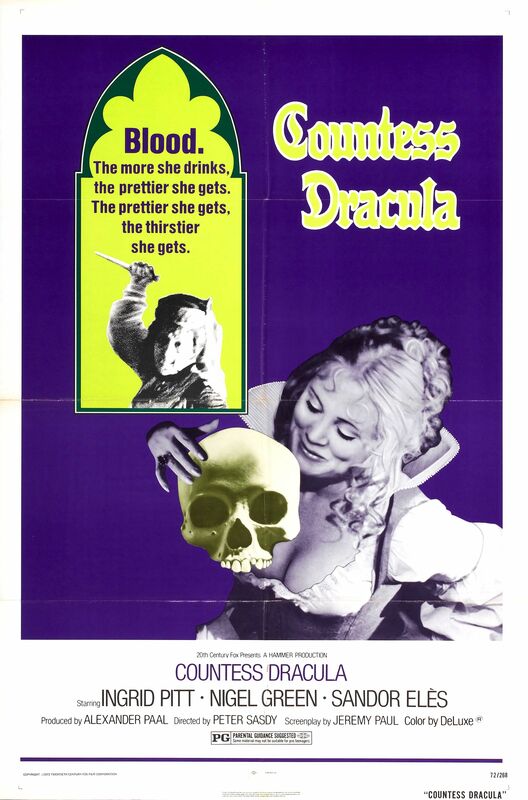 Despite its title, there are no fangs to be seen in Hammer Studios’ follow-up to Polish-born Ingrid Pitt’s memorable debut as the 200-year-old lesbian vampire Carmilla in The Vampire Lovers (1970). Here, Pitt plays the infamous serial murderess Elizabeth Bathory, nicknamed “Countess Dracula” because of the blood she shed in the name of (vainly) attempting to preserve her own youth. The problem with Countess Dracula is that Pitt’s character — apparently one of the most cold-blooded female sociopaths in the annals of history — is portrayed as both heinously villainous and petulantly pathetic. The two shouldn’t necessarily be in conflict (plenty of screen villains are pathetic), but there are enough semi-decent characters supporting Pitt in her endeavors — including her long-time lover (Green) and her loyal nursemaid (Patience Collier) — that we get a bit confused. Meanwhile, Pitt’s real-life daughter (Downs) — who we long to see striking back at her viciously narcissistic mother — is imprisoned for most of the film, and we primarily see her being humiliated. While this film has its share of cult fans, it’s ultimately a disappointment. 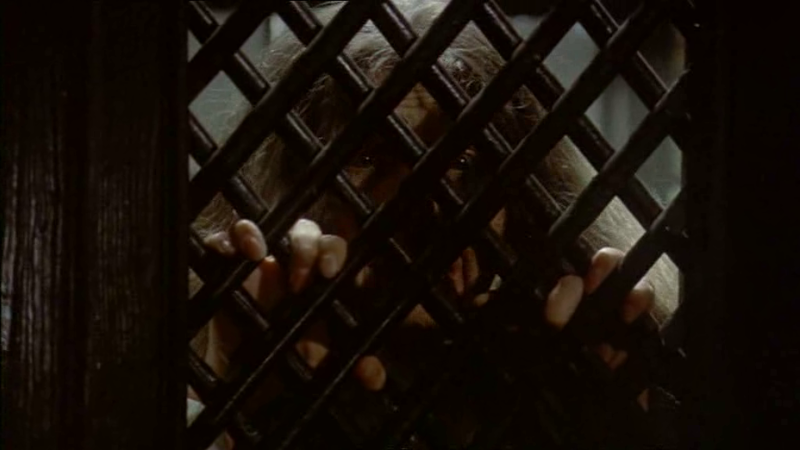 Note: Bathory’s travails were even more gruesomely and realistically portrayed in Walerian Borowczyk’s Immoral Tales (1974). No; this one is only must-see for Hammer horror aficianados. Not must-see, and rather in total agreement with this assessment. Gave it a rewatch (after many years) not that long ago and found it surprisingly tepid. And, yes, confusing. Stick with Pitt in the superior ‘The Vampire Lovers’ instead. Not a must see, but a good, solid film. 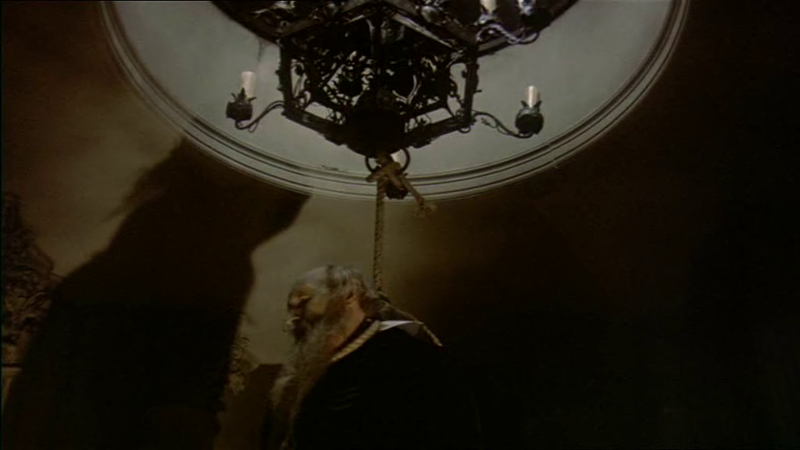 It benefits from having lavish sets left over from Anne of the Thousand Days (1969). Pitt is pretty good in this one despite being dubbed by another actress and the cast are universally good. Don’t know how you guys found it confusing. Much better than the weak and rather coy The Vampire Lovers (1970).